LoadComplete, the creators of The Fishercat game has just released a charming mobile game for mobile. Named as Marimo League, the game challenges you to become the most trustable avatar by attracting more and more believers. In the game, you fight against the rivals in a number of arena leagues to gain more believers, offerings, access to the master league, and higher-rank challenges. 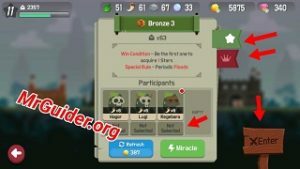 Let’s have a look at the Marimo League guide and Marimo League tips, cheats & strategies to conquer every single league. ⇒The player starts the game from Jungle league and learns all the basics concept of the game. As soon as you complete the Jungle league, the prayer feature will get unlocked and you will be promoted to the higher-rank arena. Every arena league(Jungle, Waterfall, Stone arena) is classified into the ranks; bronze, silver, gold, and the master. You start from bronze, then silver -> gold -> master. To progress to the next rank, you will have to win the challenge stage. As you progress further, you will face challenging opponents and the progress rate might dip. ⇒From the master league, you can earn beads as well as offerings. ⇒The player can play the current arena rank stage as well as old stages(already completed)over and over again. However, the previously cleared stages have a cooldown time. ⇒If you are struggling to clear a challenge stage, you can switch to the normal stage and farm offerings to upgrade totem, miracle. ⇒In Marimo League, before you start the battle, you can choose one of the available participants/warriors. All the warriors have different stats, skills & weapons. Tapping the warrior will show you the details. Select any one and hit the enter board. ⇒In the battle, character attacks the enemy automatically. All you have to do is use the miracle at the right time. Also, drop in the right place. In addition to the miracle, warrior stats, the totem in shrine also plays an important role. By building a powerful Totem, you can enhance the stats of the warrior, buff the warrior with powerful skills. ⇒You can cancel the skill by dragging it back to the skill slot. ⇒If you get the victory, you will gain more believers and the player rank will also increase. As the rank increases, you will be able to access more miracle, features. On the shrine screen, at the top-left corner, you can see the current rank. Tap it and it will show you the current number of believers you have and the number of believers required to reach the next rank. ⇒If you get the defeat, believers will leave you and you will have to work more to gain more. ⇒There are three types of magical skills/miracle in Marimo League; attack, HP, and the spell. You can equip up to five miracles. Attack miracle skills are used in dealing damage to the enemy. HP miracle skills are used in healing or restoring the health of the warrior. Spells are of many types; healing, damage, defense. All these miracles have a set cooldown time. So make sure to use these miracles at the right time. In addition to it, you should drop the miracle in the right place as the enemy can also take advantage of these magic skills if the warrior fails to collect. While spells(damage) should be dropped over the enemy. ⇒Tap Tiki the priest on Shrine screen. Here you can learn, upgrade the miracles using offerings. Rank up to unlock more skills. ⇒As we mentioned above, totem build also plays an important role. To build a totem, you need mask, body, and wings. All these items can be crafted with the help of MU the Craftsman. You use materials such as leaves, fang, and minerals to craft the totem. Leaves – to craft totem bodies. Fangs – to craft Totem masks. Minerals – to craft Totem wings. ⇒Tap the totem on the Shrine screen. Here you can drag totem body, mask, and the wing to one of the empty slots. You can unlock more empty slots by increasing the player rank. ⇒Offering is one of the useful in-game items in the Marimo League game. Marimos in the shrine produces offerings for you. Tap the offerings storage -> upgrade it to increase the storage, production rate, production bonus. Additionally, you can earn offerings from the league battles. ⇒Complete the prayer to earn leaves, fang, material, gems, and believers. ⇒Complete the labor tasks to earn gems, tokens/feather. You can use tokens in the faith tab. ⇒Head to the faith tab -> here you can see the records of faith lie eternally; grace, authority, glory, revival, and prosperity. To record faith, you need tokens. Select any record -> touch any fragment -> spend tokens. You will get a permanent boost by completing these records. Tap on a fragment to see the record of faith effects. You can use these gems for the tickets. Go to the shop/store menu -> here you can buy crafting tickets, pouch/box of materials, offerings using the gems. From the crafting tickets, you can obtain rare/common/epic/unique and powerful totems. At the bottom-left corner of the Shrine screen, tap the scroll button -> totem index/warrior index. In the totem index, you can see the complete list of Totems. In the warrior index, you can see the complete list of Warriors. Totems grade; common, rare, unique, legend. Warrior Grade; novice, warrior, elite, champion. Totems can be obtained using the crafting tickets or you can build with the help of craftsman. New warriors get unlocked as you progress further in the arena league. Choose the warrior to record him in the index. So this would be all for now as Marimo League guide. Let’s have a look at our top Marimo League tips, cheats & strategies! As you know, the enemy can also take advantage of the miracle, dropped by you for the warrior. Since you don’t have full control over the warrior, you should wait for the right moment. We would recommend you to drop the miracle in the back direction of the warrior and drop it far away. When you drop the miracle in the back direction, the warrior will stop the combat and run towards the miracle point. ⇒It would be a great idea to drop the miracle far away when the enemy is hitting you over and over again or just after you the see the enemy using its skill. This action saves you from the enemy hits or acts as dodging. By level 14, you can pick up to four skills and as soon as you reach level 23, you will be able to use all the slots(5). We would recommend you to pick a spell, two HP skills, and two attack skills. But that’s not enough. In each skill range, you have many varieties. For example; HP miracle; Fruit, meat, and more. To choose the right miracles, compare the stats of every single skill. For example; When choosing the HP skill, pay attention to the HP recovery amount. When choosing the attack skill, pay attention to the damage stats. To get the most out of the miracles, make sure to level up them. Totem stats impact the warrior stats, opted by you before the battle. If you want to strike down the powerful enemy, you should focus on building a powerful totem. In the guide part above, we have already mentioned the totem system; you can upgrade the totem parts, draw rare/legend parts from the crafting tickets, unlock more slots by increasing the rank. Gem is the premium in-game currency in Marimo League game. You can get it for free by watching the video ads. All you need to do is break the black stone. Every now and then, a Marimo will bring the black stone(keep an eye on the Shrine menu screen). 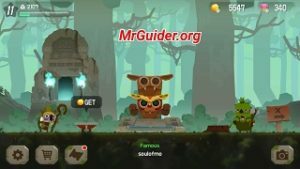 Tap it -> watch the video ad -> claim free gems. MU the Craftsman in Shrine takes time in crafting. When the crafting time is less than the one minute, you can speed-up the crafting process. All you need to do is tap the craftsman -> tap the screen recklessly. Complete the prayer, labor tasks for the material items, gems, and tokens. Use material items in crafting totem parts, gems in the shop, and tokens to record the faith.